Ketchum's Chase Caulkins, the winner of last July's Backcountry Run 10-mile men's event, is traveling in select trail running circles this year. 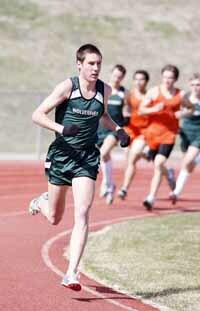 Caulkins, 19, was one of four American men recently named to the USA Junior Mountain Running Team headed to the 2011 World Mountain Running Championships Sept. 11 at Tirana, Albania. The others are Oliver Bear Don't Walk, 18, of Everson, Wash.; Billy Fayette, 18, of Clarendon Hills, Ill.; and Ryan Lee, 19, of Wilmington, Del. The three junior women are Krisztina Dearborn, 19, of Mirror Lake, Wash.; Clare Moretz, 18, of Madison, Va.; and Lara Shegoski, 19, of Belle Mead, N.J.
"I'm really excited about this year's junior team," said Paul Kirsch, team manager of the U.S. juniors. "The course in Tirana is a fast one and the combination of strength and speed that our juniors have this year gives them a good shot at being on the podium." Junior men race two 4.5-kilometer laps on the up-and-down courses in Albania. Visit usmrt.com or wmrc2011.al for updates on September's races. Entering his sophomore year running at the University of Portland (Ore.), former Wood River High School distance running star Caulkins is a U.S. Junior Mountain Running Team member for a second consecutive year. Last year he was the top American junior. Caulkins recently placed an impressive fourth of 36 finishers in the 5000-meter run of the USA Track and Field Outdoor Junior Championships staged June 25 at Hayward Field in Eugene, Ore. He was only 15 seconds off the winning time. Ammar Moussa of California (14:09.61) won the 5000m race ahead of Parker Stinson of Oregon (14:10.59). Third place went to Jacob Hurysz of North Carolina (14:14.84) and Caulkins was fourth (14:24.34). During last year's college cross country season, Caulkins ran an 8k time of 24:19. He is a son of Brian and Sandra Caulkins.